Marvel is taking Spider-Man back to his classic roots in not only costume, but also personality. As evident in the most recent Captain America: Civil War footage, the wall-crawler is a wisecracker who throws jokes faster than he does fists. Yesterday, we got to see more of Tom Holland as this iconic Marvel Comic Book character as he took out The Flacon before fighting The Winter Soldier. Today, another short TV spot has arrived, and it has Peter Parker facing off against Steve Rogers. And yes, he has some witty one-liners to shout before heading into battle. 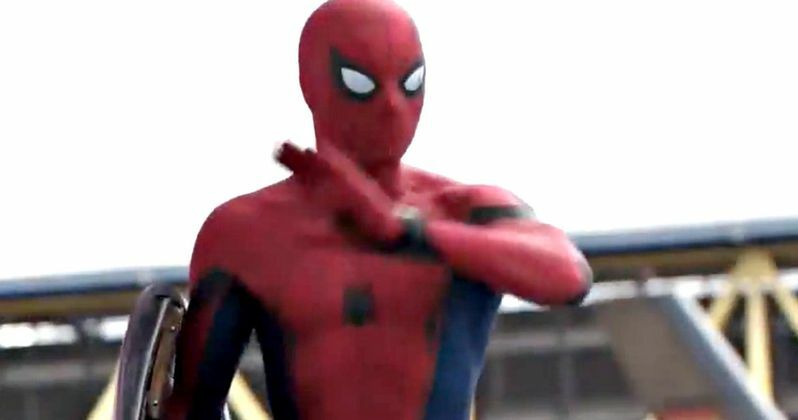 Spidey makes his official Marvel Cinematic Universe debut in Captain America: Civil War before headlining his own solo adventure next summer. Spider-Man: Homecoming marks a unique relationship between Marvel and Sony, and apparently, Marvel Studios has quite a bit of creative control over rebooting this iconic superhero for the big screen a third time. Says Marvel boss Kevin Feige in a recent interview. "Well, I've known all those people [at Sony] for a very long time. Amy Pascal, Tom Rothman, who runs Sony now, I've known for years. So, it's been great. They really are supportive in allowing us to make the creative decisions to make [Spider-Man: Homecoming], but they've been great partners. So far so good on that movie." In Marvel's Civil War, Steve Rogers leads a newly formed team of Avengers in their continued efforts to safeguard humanity in Captain America: Civil War, which is set in the aftermath of Avengers: Age of Ultron. But after another incident involving the Avengers results in collateral damage, political pressure mounts to install a system of accountability, headed by a governing body to oversee and direct the team. The new status quo fractures the Avengers, resulting in two camps, one led by Steve Rogers and his desire for the Avengers to remain free to defend humanity without government interference, and the other following Tony Stark's surprising decision to support government oversight and accountability. This adventure splits the Marvel universe in half, with heroes joining forces with either Captain America or Iron Man. Team Iron Man includes Tony Stark (Robert Downey Jr.), Black Widow (Scarlett Johansson), Vision (Paul Bettany), War Machine (Don Cheadle) and the new characters T'challa (Chadwick Boseman) and Spider-Man (Tom Holland}). Team Cap includes Captain America (Chris Evans), The Falcon (Anthony Mackie), Scarlet Witch (Elizabeth Olsen), Hawkeye (Jeremy Renner), Ant-Man (Paul Rudd) and The Winter Soldier (Sebastian Stan). Captain America: Civil War also stars Frank Grillo as Crossbones and William Hurt, reprising his role from The Incredible Hulk as Thaddeus Ross. Anthony Russo and Joe Russo direct Marvel's Civil War from a script by Christopher Markus and Stephen McFeely. The writers and directors will team up again later this year when production starts on the massive Avengers: Infinity War Part I and Avengers: Infinity War Part II, which are set for release in 2018 and 2019, respectively. Tom Holland will also likely start production on his new movie, Spider-Man: Homecoming later this year, which has been given a July 7, 2017 release date. Take a look as Steve Rogers and Peter Parker have their first face-off in the latest Civil War sneak peek thanks to ComicBook.com.